The Quadrantid meteor shower is always the first meteor shower of every new year, and 2017 is no exception. The shower comes each year in early January and favors the Northern Hemisphere because its radiant point is so far north on the sky’s dome. In fact, the Quadrantids might be the strongest and most famous major meteor shower that you’ve never seen. That’s because, although it can match the meteor numbers (50 to 100 meteors or more an hour) of the better-known August Perseid and December Geminid showers, the Quadrantids’ peak is very narrow. The peaks of the Perseid shower or Geminid shower persist more or less for a day or more, allowing all time zones around the world to enjoy a good display of Perseids and Geminids. Meanwhile, the peak of the Quadrantid meteor shower lasts only a few hours. So you have to be on the right part of Earth, the part that’s in nighttime – preferably with the radiant high in your sky – during those few hours of the shower’s peak, in order to see the most Quadrantid meteors. Follow the links below to learn more about the Quadrantids in 2017. What are the peak dates for the Quadrantid shower in 2017? Who will see the Quadrantid meteor shower best in 2017? What time should I watch the Quadrantid meteor shower in 2017? Where is the radiant point for the Quadrantid shower? The Quadrantids are named for a constellation that no longer exists. Quadrantid meteors have a mysterious parent object. What are the peak dates for the Quadrantid shower in 2017? Peak dates for the Quadrantid shower in 2017 Different sources give different dates and precise times for meteor shower peaks. In 2017, various sources – such as the International Meteor Organization and the Society for Popular Astronomy in the U.K. – give the peak as January 3 at 14:00 UTC. If that prediction holds true, the Americas will have the best shot at the shower on the morning of January 3. Those in Asia should try the hours after midnight on the morning of January 4. But predictions aren’t always accurate, so from any northerly latitudes, try watching in the dark hours before dawn on January 3 and/or 4. So you see … this shower is a gamble! What time should I watch the Quadrantid meteor shower in 2017? All other things being equal, for any meteor showers, you are likely to see the most meteors when the radiant is high in the sky. In the case of the Quadrantid shower, the radiant point is seen highest in the sky in the dark hour before dawn. Unlike most meteor showers, however, you have to hope that the narrow peak of Quadrantid shower happens at or near the same hour that the radiant point resides highest in your sky. Here’s that peak time again, according to the International Meteor Organization: January 4 at 2:00 Universal Time. Click here to translate Universal Time to your time zone. 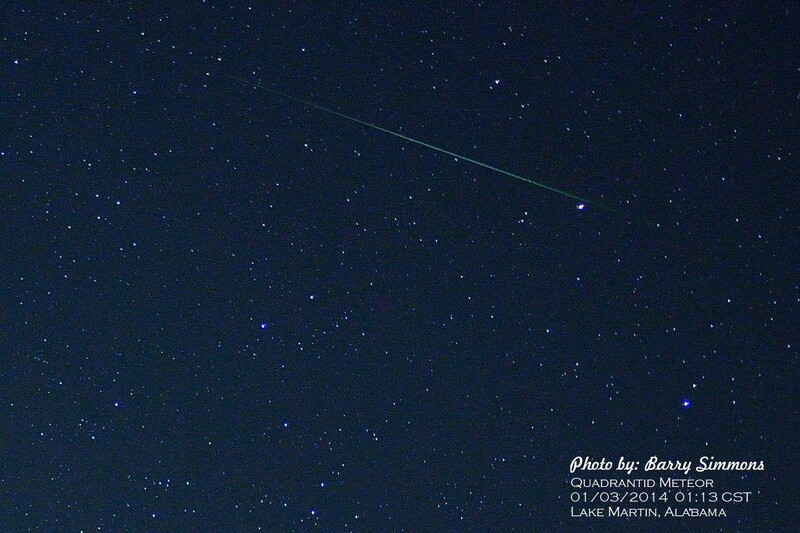 Barry Simmons in Lake Martin, Alabama captured this Quadrantid meteor on the morning of January 3, 2014. Thank you, Barry. 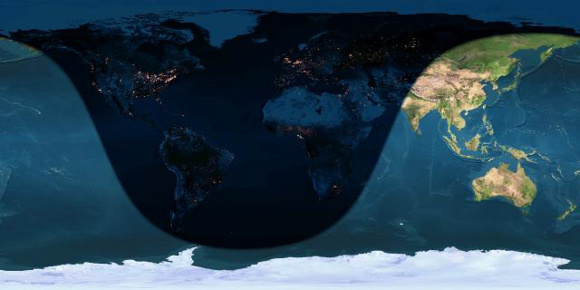 If the prediction holds – which is a big IF – northwestern Asia and East Europe will be in the best position to watch this year’s Quadrantid shower, during the dark hour before dawn January 3, 2017. The shadow line crossing Asia represents sunrise January 3.
Who will see the Quadrantid meteor shower best? Where is the Quadrantids’ radiant point? All other things being equal, for any meteor shower, you are likely to see the most meteors when the radiant is high in the sky. In the case of the Quadrantid shower, the radiant point is seen highest in the sky in the dark hour before dawn. Now for our usual caveat. 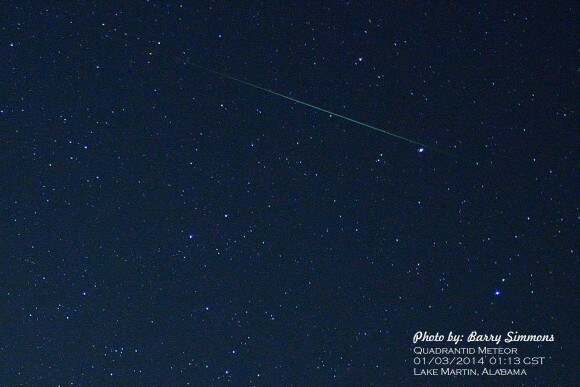 You don’t need to find the meteor shower radiant to see the Quadrantid meteors. You just have to be at mid-northern or far-northern latitudes, up in the wee hours of the morning and hope the peak comes at just the right time to your part of the world. 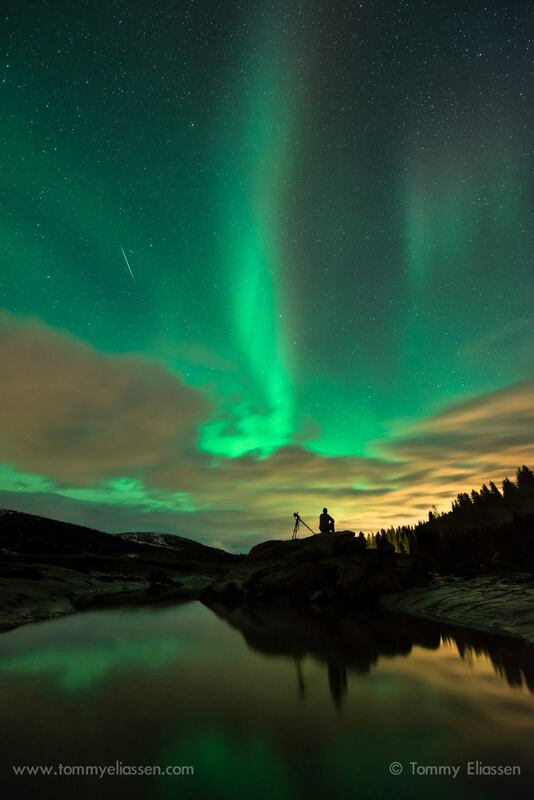 The meteors will radiate from the northern sky, but appear in all parts of the sky. From mid-northern latitudes, the radiant point for the Quadrantid shower doesn’t climb over the horizon until after midnight. The now-defunct constellation Quadrans Muralis, for which the Quadrantids are named. Image via Atlas Coelestis. The Quadrantids are named for a constellation that no longer exists. Most meteor showers are named for the constellations from which they appear to radiate. So it is with the Quadrantids. But the Quadrantids’ constellation no longer exists. 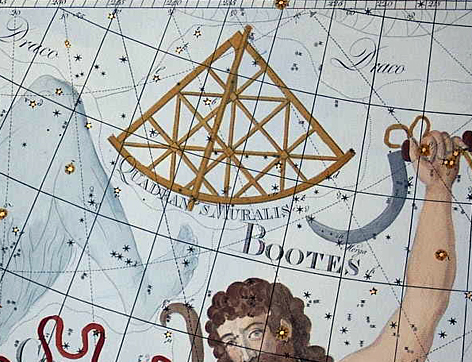 The name Quadrantids comes from the constellation Quadrans Muralis (Mural Quadrant), created by the French astronomer Jerome Lalande in 1795. This now-obsolete constellation was located between the constellations of Bootes the Herdsman and Draco the Dragon. Where did it go? To understand the history of the Quadrantids’ name, we have to go back to the earliest observations of this shower. In early January 1825, Antonio Brucalassi in Italy reported that “the atmosphere was traversed by a multitude of the luminous bodies known by the name of falling stars.” They appeared to radiate from Quadrans Muralis. In 1839, Adolphe Quetelet of Brussels Observatory in Belgium and Edward C. Herrick in Connecticut independently made the suggestion that the Quadrantids are an annual shower. But, in 1922, the International Astronomical Union devised a list 88 modern constellations. The list was agreed upon by the International Astronomical Union at its inaugural General Assembly held in Rome in May 1922. It did not include a constellation Quadrans Muralis. Today, this meteor shower retains the name Quadrantids, for the original and now obsolete constellation Quadrans Muralis. 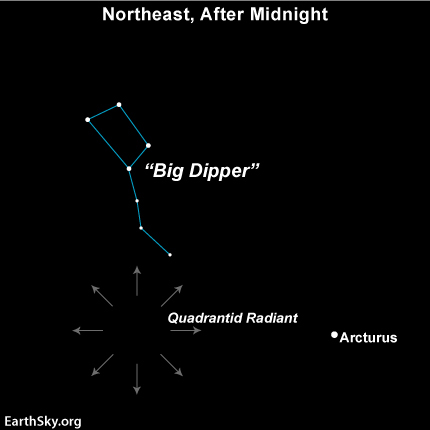 The radiant point for the Quadrantids is now considered to be at the northern tip of Bootes, near the Big Dipper asterism in our sky, not far from Bootes’ brightest star Arcturus. It is very far north on the sky’s dome, which is why Southern Hemisphere observers probably won’t see many (if any) Quadrantid meteors. The meteors simply won’t make it above the horizon for Southern Hemisphere skywatchers. In 2003, Peter Jenniskens proposed that this object, 2003 EH1, is the parent body of the Quadrantid meteor shower. Quadrantid meteors have a mysterious parent object. In 2003, astronomer Peter Jenniskens tentatively identified the parent body of the Quadrantids as the asteroid 2003 EH1. If indeed this body is the Quadrantids parent, then the Quadrantids, like the Geminid meteors, come from a rocky body – not an icy comet. Strange. In turn, though, 2003 EH1 might be the same object as the comet C/1490 Y1, which was observed by Chinese, Japanese and Korean astronomers 500 years ago. So the exact story behind the Quadrantids’ parent object remains somewhat mysterious. Bottom line: The first major meteor shower of 2017, and every year, the Quadrantid meteor shower, will probably be at its best in the hours between midnight and dawn January 3 or 4. This shower is best for the Northern Hemisphere because its radiant point is far to the north on the sky’s dome. How do I translate Universal Time to my time zone?